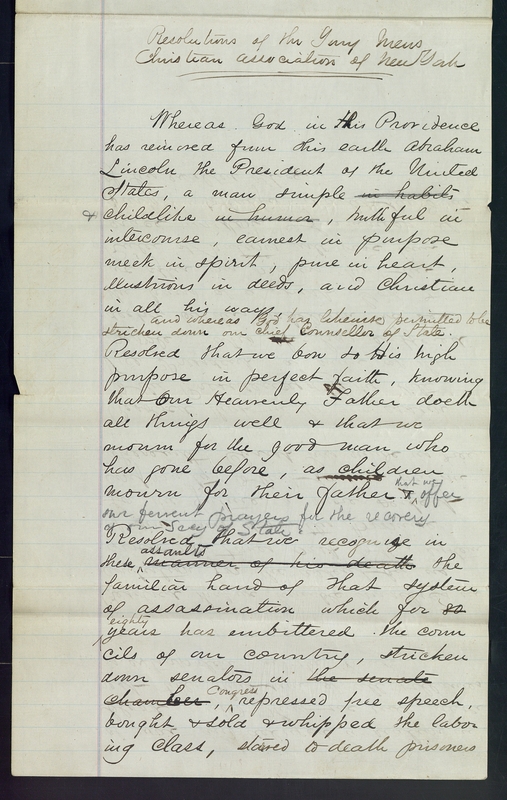 Resolutions of and received by the New York Young Men's Christian Association following the death of Lincoln, including resolutions from the YMCA of Renshaw Street (Liverpool, England) and the Montreal YMCA. and whereas God has likewise permitted to be stricken down our chief Counsellor of State. Resolved that we bow to His high purpose in perfect faith, knowing that our Heavenly Father doeth all things well and that we mourn for the good man who has gone before, as children mourn for their father, that we offer our fervent prayers for the recovery of our Sect. of State!